Live in Buenos Aires like a porteno, soaking up the vibrant atmosphere of this cosmopolitan city. The apartment is located in a small, 8 story building built in 2007, containing only 8 apartments. It is a 3 bedroom duplex with two full baths (including bidet) one containing a jet tub. One bedroom is a master with en suite and a queen-sized bed. The second bedroom contains two single beds. In addition, there is an office in the third bedroom that could accommodate an additional bed. The apartment is air conditioned and has a fully stocked kitchen with dishwasher. The apartment also has a terrace with a built-in parillia (for that authentic argentinian barbeque). We are asking that every visitor leave a bottle of wine upon departure and add a book to the growing library with an inscription describing their stay. 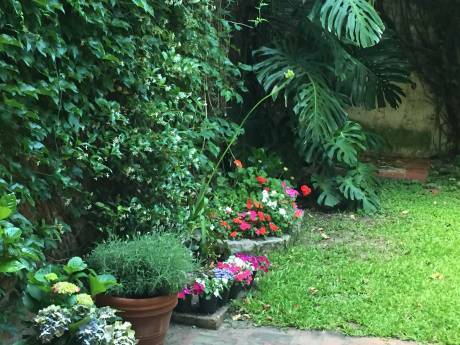 The apartment is located on quiet street in the one of the best kept secrets of Buenos Aires, Argentina (the barrio of Caballito). From there, you have easy access to the sights. We are a party of 2 (41 and 49 years old) non smokers who enjoy travel. We are interested in exploring new places and meeting new people.